In a nutshell, portfolio income in real estate is basically income on paper in the form of equity. You still need to either sell or refinance a property to make use of your equity. Any property bought below market value should have a big potential for a gain in equity, if it really was bought below market value. Portfolio income may boost one’s net worth and may give one bragging rights, but as Rich Dad would put it, someone’s net worth is often “worth less” than they think. In other words, if one’s equity cannot be turned into cash, or if the property cannot generate any positive cashflow, then those properties are “worth less” as they really are not assets that put money in your pocket but are rather liabilities that take money away from your pocket. Earned income that one can gain through capital gains, and commissions(now referred to as professional fees because of the RESA LAW) is a relatively quicker way of earning from real estate investing, but should not be looked at as a means to get rich quick. I believe that the earned income one can get through capital gains from flipping properties should be used to acquire passive income generating assets later on. Although it may appear that earned income through flipping properties received a bashing from me when I compared it to the rat race, make no mistake, I still believe that we still need to flip properties for capital gains as it is a great way to build capital. 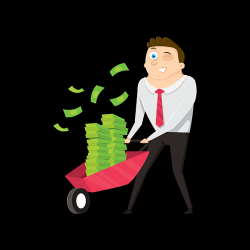 This can then be used later on to buy bigger deals that can produce bigger positive cashflow, much like lesson #2 in the Top 7 lessons I learned from playing Rich Dad’s Cashflow 101 game. Passive income, considered by many as the holy grail of real estate investing, can really help one become financially free, but there are a lot of things one should remember when investing for passive income. Let me summarize them below. Proper pre-screening of tenants is needed to avoid “tenants from hell”. Failure to do this can spell disaster. Rental properties require competent property management and maintenance. It is the hardest real estate investing technique to do because finding properties that can generate positive cashflow is more difficult than finding properties that can be flipped for a profit, and this applies whether you buy foreclosed properties from banks, or those that are for sale by owners or FSBO’s. It may sound simple, but is definitely not easy. Although it may not be easy, it is easier than most people think. It is definitely easier than spending most of your life stuck in the rat race as an employee. Negatively geared rental properties can become positively geared eventually through rental escalation(Thanks Gio for reminding me about this through your comment), provided the property is in a good location. Of course, it would be ideal to have a rental property produce positive cashflow from the very start. Which investing strategy should you use? In other words, make sure you buy properties below market value. How much below market value? That would depend on your profit targets but a safe target would be to acquire properties between 40% to 50% below market value. In effect, that discount would translate to a bigger potential for equity gain. This would help ensure that a deal will really be profitable, provided you were able to arrive at a fairly accurate estimate of a property’s market value. As mentioned earlier in this post, one can potentially raise capital faster by flipping properties that are bought at a price below market value for capital gains, or even through the accumulation of “professional fees” by acting as a real estate broker or agent. These can then be used later on to buy bigger deals that can produce bigger positive cashflow. The capital that can be raised through flipping properties can then be used to acquire income generating rental properties. I hope you have enjoyed reading this series as much as I enjoyed writing it. I would like to believe that I have this burning passion for real estate investing and I wish that somehow, I was able to share this passion of mine through this post. Feel free to let me know what you think by leaving a comment below. Thanks! Text by Jay Castillo and Cherry Castillo. Copyright © 2010 All rights reserved. PPPS. Don’t be the last to know, subscribe to e-mail alerts and get notified of new listings of bank foreclosed properties, public auction schedules, and real estate investing tips. Inbox getting full? Subscribe through my RSS Feed instead!